Future Market Insights has announced the addition of the “Steel Drums Market: Reconditioning and Recyclability to Play a Critical Role in Demand Growth: Global Industry Analysis 2013 - 2017 and Opportunity Assessment 2018 - 2027" report to their offering. The 40-60 gallon steel drums currently hold around 3/4th share of the total market value, and are projected for the highest yearly revenue growth in 2019 and ahead. Tighthead steel drums that represent the revenue of nearly US$ 5.5 billion at present, are slated for healthy growth in demand over the course of coming years. With steady adoption estimation, year over year, carbon steel drums remain the top-selling drum type in steel drums market. Future Market Insights in its recently released market intelligence outlook projects promising revenue growth prospects for the global steel drums market. Owing to high recyclability and exceptional functional attributes over a majority of other metals, steel drums are likely to witness steady demand worldwide, for a range of industrial storage and packaging applications. 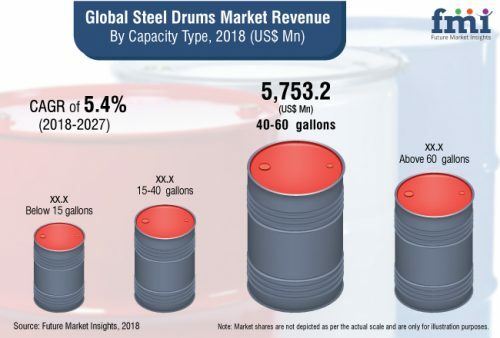 The global sales of steel drums are estimated to reach over US$ 8 billion in 2019, as indicated by the report published by FMI. “Being one of the key industries driving the demand for steel drums, the resurgence of chemicals domain has been benefiting steel drums manufacturers in recent past. Growing market value of industrial bulk containers is directly translating into the propelling demand for steel drums for industrial applications,” says a senior research analyst at the company. “Developing Asian economies are likely to create a heap of investment opportunities in the chemicals & solvents, oil & gas, and export industries,” the analyst adds further. A steadily improving scenario of chemicals, solvents, and oil export across APEJ, especially in Southeast Asian countries, is favoring the growth of steel drums market in the region. While exporters are preferring steel drums for bulk packaging, it is more likely that steel drums would encounter lucrative opportunities in the non-hazardous materials packaging and transport section owing to their attributes facilitating the shipment. As stated by the American Iron & Steel Institute, steel has a recycling rate of approximately 88% and is recyclable at a level higher than that of any other metal or the combination of other metals and materials. Besides sustainability, the US Department of Transportation ranks steel drums as the safest bulk containers when it comes to recoding incident rates. The lowest insurance rates associated with shipment of steel drums is another factor pushing their adoption at a global level. Exceptional recyclability without performance degradation will remain the top factor pushing the preference of recycled steel drums across the supply chain. Reconditioning for the reuse of steel drums is currently trending the market, which is poised to shape the market expansion over the next few years. While 33-35% share of the total steel drums market value is accounted by the most prominent international players including Greif Inc., C.L.Smith, Industrial Container Services, Mauser Group, and Schutz Container Systems, Inc., the rest of the global market revenue is contributed by a large number of regional and domestic players. The report, in addition to elaborating on the competition scenario of global steel drums market landscape, uncovers the most profitable developmental strategies adopted by companies operating in global steel drums landscape. Besides production facility expansion, companies active in steel drums market are focusing on strategic mergers and acquisitions, and collaboration deals, says the report. Customization in terms of storage capacity, pricing, endurance, service life, corrosion resistance, and key application, is identified to be among the key strategies adopted by leading companies competing in steel drums market place. Grief Inc., one of the top companies in metal drums space, recently announced the expansion in Texas through voluminous investments in drums and IBC segments. It is more likely that the company would further target the Asian region for expansion of the production base. Grief is currently focusing on production capacity expansion across North American region to tap into significant demand-driven opportunities. Sicagen India Ltd., another prominent player in the global steel drums landscape, is accomplishing facility expansion through strategic M&A. The company’s recent acquisitions include that of Danish Steel. Manufacturers, suppliers, transporters, and other concerned stakeholders across the value chain often find it challenging to maintain complete security of combustible and flammable industrial materials. Steel drums manufacturers are thus rapidly adopting fusible plugs for closing drums in case of warehousing and shipping of flammable and combustible materials.